So PokerStars has come up with a really cool idea for a tournament format that I don't think has ever been done. There will be two tournaments called "Outlast the Pros" and they'll take place at 13:00 EST and 20:00 EST on Tuesday. To find which players are online at any time, open the PokerStars software and click the �Team Pro� button at the bottom of the main lobby window. Alternatively, click �Requests� in the top menu bar and select �Find a Team PokerStars Player�. To register for an Outlast the Pro tournament, open the PokerStars lobby, click �Tourney� & �All�. So here's the unique twist. The tournament is an $11 buy in and PokerStars is adding $1000 to the prize pool. 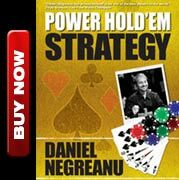 Your goal is to outlast ALL of the Team PokerStars Pros that entered the tournament. Once the very last team pro is eliminated, everyone left in the tournament will divvy up the $1000 that was added by PokerStars, evenly. So that makes for some interesting side rooting! If you are one of the big stacks, you' are obviously hoping that the Pros stay alive as long as possible so that you get a bigger piece of the pie. If you are a short stack, then you want to see the pros go broke! For example. if a Team Pro makes it all the way to 7th place, that means the remaining 6 players will chop up $1000, for a bonus of $166.67 each. If the last Team Pro standing busts out in 101st place, then the remaining 100 players add $10 to their bankroll. In addition to the added money, you are also obviously playing for the actual prize pool. Expect to see most of our Team Pros playing in these every Tuesday between Dec 8th and Dec 29th. I just got back to Vegas yesterday after filming the finale of the PokerStars.net Million Dollar Challenge and I can say with all honesty, that it was the most exciting poker show I've ever been involved with and you don't want to miss the finale! There is a show airing on December 13th on FOX after the football game, and the finale will air on December 27th, once again on FOX after the football game. If you set your Tivo or DVR, I'd suggest taping the show following, just in case the game goes into overtime and we are delayed. Last night I was watching Amazing Race and Survivor and I got to thinking: on Survivor, these guys starve in the same dirty clothes eating rats, living in awful conditions for 39 days, all for a chance to win a million dollars. On Amazing Race, you travel the world in a frantic race against other teams with a partner, for a SHARE of a million dollars. Then I compared that to our show: you fly first class to LA, play a celebrity on national television, stay at a nice hotel, eat whatever you want, and if you get a little lucky, you have a shot at a million dollars... hmm, seems to me that if you had the choice, being on the PokerStars.net Million Dollar Challenge would be the way to go! I'm happy to be home and am planning on working on my mind, body and soul this month. Back to eating right, working out, and gearing up for the Bellagio tournament on the 14th. I also decided to do something I'd never done before, but thought it might be a good idea with all that's gone on for me this year with my mother. When she passed it all hadn't really sunk in, but it's starting to. So, I decided to go see a therapist and just talk about what I'm feeling in regards to the loss. I was really close with my mother and she was my rock in so many ways. I have lots of good friends who support me, but I just thought it might be helpful to talk to a professional about it all so I can avoid making any foolish, self-destructive mistakes. I went this morning, actually, and plan on trying to go once a week. I am not embarrassed to share that in the least. I am a very confident person by nature, not afraid to share, and don't see it as a weakness at all. Quite the opposite really. I think more people should go, especially young poker players who often live an unhealthy lifestyle both mentally and physically. Being in your early 20's, having too much money, and living in Vegas, can lead to disaster for a lot of kids if they don't take control of their lives. Strip joints, alcohol, drugs, gambling, etc. may seem like "woo hoo fun times" and it may seem on the surface like you are "living the life," but at the core, it's kind of sad, pathetic, and empty. I feel bad for some of the online kids actually. Genuinely bad when I see them headed down the wrong path, but I know there isn't much I can do to help them. They need to see it for themselves and grow out of it. If they don't, they just won't be around in 5 years. T.J. Cloutier used to always answer questions about young players the same way, "So is this kid the best of all time?" and T.J. would say, "See me in 5 to 10 years and we'll see if they are still around." Money comes, and money goes when you play poker for a living. Whether you have money or not, though, happiness really is completely unrelated to the size of your bankroll. That might not be true for "regular people" who have real jobs, but poker players are a different breed. In fact, before the boom I saw a vicious cycle that I even feel victim to at one point. You work so hard to make money, playing day in and day out, then all of a sudden you've made that money. Now what? All you've known is the grind for so long, so what do you do now? 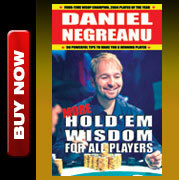 You don't NEED to play poker anymore, you don't NEED to work at all. How do you replace that time? Well, you either find a passion for playing the game again while balancing a healthy social life, or, you get self-destructive and blow the whole bankroll so you'll once again have a purpose! Back to the grind to build it all over again. There was one guy I knew who did this habitually for 10 years and I'm sad to say that I think he'll do it for the rest of his life. Don't be that guy!